Image by Timely Matters Inc.
On-Task On-Time for Kids is a helpful tool to get children through their routines more efficiently and independently. It teaches time management skills and helps reduce frustrating interactions between adults and children about getting chores and other tasks done. It can be used alone or with a reward system to help children become more successful in managing themselves. 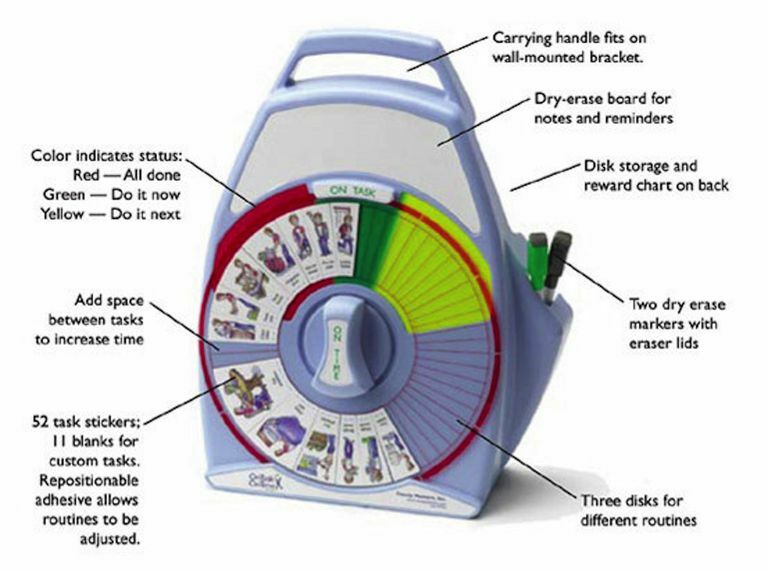 This product from Timely Matters Inc. offers benefits for children, parents and teachers alike. While parents may enjoy it as a discipline tool, children benefit by learning a sense of responsibility. On-Task On-Time not only helps caregivers of children keep them focused as they finish chores, but it can also be used with a behavior intervention system, including positive reinforcement. With the product, adults will no longer have to nag children as much about completing tasks, and children may see an improvement in executive functioning skills and self-management ability over time. The reality, however, is that On-Task On-Time won't work for every child. Some children with significant behavior problems will need continued support from a behavior plan. A busy parent of three developed On-Task On-Time. The product is a large timer, roughly a foot tall. It is a wind-up timer, much like a kitchen timer but with a helpful twist. The unit allows parents and teachers to develop a schedule of tasks for children that must be finished within a time period. The adult simply makes the schedule, places it on the unit, winds it up and the child takes over from there. The schedule is made by using a plastic disc that fits onto the unit. Also, picture stickers depict tasks to be performed. The unit ticks away the minutes, the disc rotates, and the task that a child should be working on moves into the top green space. Tasks that are overdue rotate into a red space. Tasks that are coming up appear in a yellow space. The colors give the child a visual reminder and motivation to work faster to complete tasks on time. The best feature of the On-Task On-Time unit is that it promotes independence in children and can help reduce the need for parents to remind (or nag) children into getting their chores done. On-Task On-Time isn't magic. It won't turn a slacker, or unmotivated child, into a workhorse. Accordingly, parents and teachers should keep their expectations in check about this product. If it improves a child's work habits, celebrates that achievement. But if it doesn't, seek alternative ways to instill discipline and time management skills into the children who need to develop such strengths.